Max Laue was born on October 9, 1879 at Pfaffendorf, near Koblenz. He spent his youth in Brandenburg, Altona, Posen, Berlin and Strassburg, going to school in the three last-named cities. At the Protestant school at Strassburg he came under the influence of Professor Goering, who introduced him to the exact sciences. In 1898 he left school and did his military service for a year. He then went to the University of Strassburg where he studied mathematics, physics and chemistry; but soon he moved to the University of Göttingen, where he worked under Professor W. Voigt and Professor W. Abraham, who greatly influenced him. In 1902, after a semester at the University of Munich, he went to the University of Berlin to work under Professor Max Planck. Here von Laue attended lectures by O. Lummer on interference spectroscopy and heat radiation, the influence of which was shown in his dissertation on interference phenomena in plane-parallel plates. After obtaining his doctorate at Berlin in 1903, von Laue went to the University of Göttingen for two years. In 1905 he was offered the post of assistant to Max Planck at the Institute for Theoretical Physics at Berlin. Here he worked on the application of entropy to radiation fields and on the thermodynamic significance of the coherence of light waves. In 1909 he went as Privatdozent to the University of Munich, where he lectured on optics, thermodynamics and the theory of relativity. In 1912 he became Professor of Physics at the University of Zurich and in 1914 he moved, as Professor of Physics, to Frankfurt on Main. From 1916 he was engaged in war work at the University of Würzburg on high vacuum tubes used for telephony and wireless communication. In 1919 he was appointed Professor of Physics at the University of Berlin, a post which he held until 1943. From 1934 onwards he acted as consultant to the Physikalisch-Technische Reichsanstalt at Berlin-Charlottenburg. In 1917, when the Institute for Physics was established at Berlin-Dahlem with Einstein as its Director, von Laue had charge, as Second Director, of most of the administrative work. During this period, von Laue exerted considerable influence on the development of scientific research in Germany. When Berlin was bombed, the Institute moved to Hechingen in Württemberg. von Laue remained at Hechingen from 1944 until 1945; to distract his thoughts from the war, he wrote a History of Physics, which went into four editions and was translated into seven languages. Here he welcomed the arrival of French troops and was taken, together with nine other German scientists, by an Anglo-American mission to England where he remained until 1946. During his confinement in England he wrote a paper on the low absorption of X-rays during diffraction, which he contributed in 1948 to the International Union of Crystallographers at Harvard University. In 1946 he went to Göttingen as Acting Director of the Max Planck Institute and Titular Professor in the University there. In 1951 he was elected Director of the Fritz Haber Institute for Physical Chemistry at Berlin-Dahlem and here he did much work on X-ray optics in collaboration with Borrmann and others. He retired in 1958 and in 1959 his 80th birthday was celebrated in Berlin-Dahlem. He lived on, still actively at work, for another six months. von Laue's scientific work extended over a wide field. Early in his career he was greatly excited by Einstein's theory of relativity and between 1907 and 1911 he published eight papers on the application of this theory. In 1911 he published a book on the restricted theory and in 1921 another on the general theory, both books going into several editions. His best known work, for which he received the Nobel Prize for Physics for 1914, was his discovery of the diffraction of X-rays on crystals. This discovery originated, as he related in his Nobel Lecture, when he was discussing problems related to the passage of waves of light through a periodic, crystalline arrangement of particles. The idea then came to him that the much shorter electromagnetic rays, which X-rays were supposed to be, would cause some kind of diffraction or interference phenomena in a medium such as a crystal. Although his colleagues Sommerfeld, W. Wien and others, with whom he discussed the idea on a skiing expedition, raised objections to the idea, W. Friedrich, one of Sommerfeld's assistants and P. Knipping tested it out experimentally and, after some failures, succeeded in proving it to be correct. von Laue worked out the mathematical formulation of it and the discovery was published in 1912. It established the fact that X-rays are electromagnetic in nature and it opened the way to the later work of Sir William and Sir Lawrence Bragg. Subsequently von Laue made other contributions to this subject. Also prominent in von Laue's work were his contributions to the problems of superconductivity which he made when he was Professor of Theoretical Physics at Berlin University. At this time Walther Meissner was studying at the Physikalisch-Technische Reichsanstalt in Berlin the remarkable disappearance of ohmic resistance shown by many metals at temperatures of the order of that of liquid helium. An especially valuable contribution made by von Laue was his explanation, in 1932, of the fact that the threshold of the applied magnetic field, which destroys superconductivity, varies with the shape of the body because, when the magnetic field is established after the state of superconductivity has been established, the magnetic field is deformed by the supercurrents induced at the surface of the metal being used. This explanation was confirmed and it opened the way to Meissner's subsequent discovery that a superconductor eliminates the whole magnetic field in its interior and this became the basic idea of F. and H. London's theory of superconductivity. 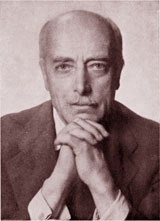 von Laue published one paper in collaboration with F. and H. London and between 1937 and 1947 he published a total of 12 papers and a book on this subject.